Static random-access memory (static RAM or SRAM) is a type of semiconductor memory that uses bistable latching circuitry (flip-flop) to store each bit. 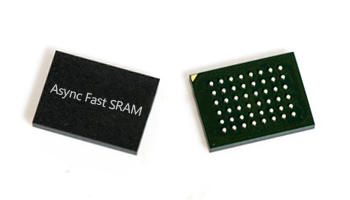 SRAM exhibits data remanence, but it is still volatile in the conventional sense that data is eventually lost when the memory is not powered.The term static differentiates SRAM from DRAM (dynamic random-access memory) which must be periodically refreshed. ISSI is a technology leader that designs, develops, and markets high performance integrated circuits for the following key markets: (i) automotive, (ii) communications, (iii) digital consumer, and (iv) industrial and medical. Our primary products are high speed and low power SRAM and low and medium density DRAM. The Company also designs and markets NOR flash products and high performance analog and mixed signal integrated circuits. We target high-growth markets with our cost-effective, high-quality semiconductor products and seek to build long-term relationships with our customers. We have been a committed long-term supplier of memory products, including lower density and smaller volume products, even through periods of tight manufacturing capacity.